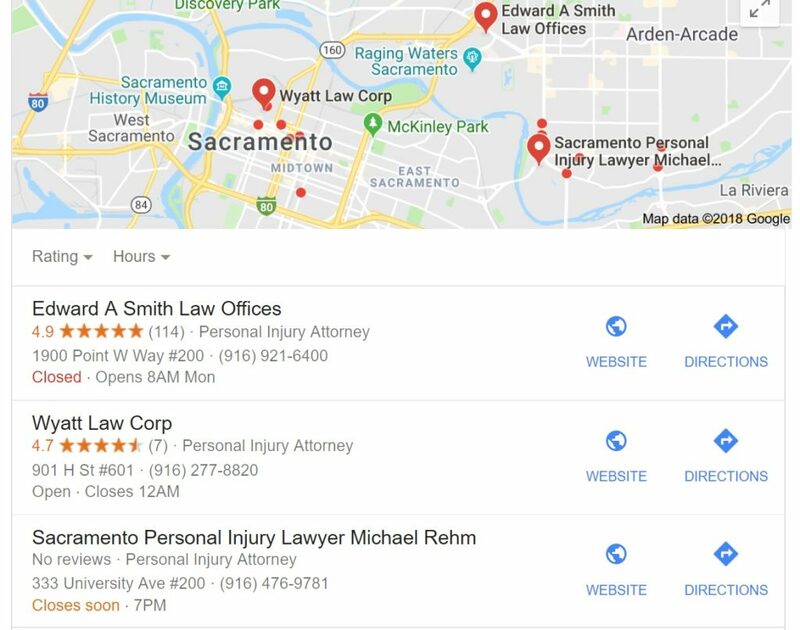 Below are step by step instructions for removing fake or spam listings for law firms in Google Maps results. If you see someone keyword stuffing their Google My Business page, this page is for you. Today we’ll address the keyword stuffing form of fake listings, although the below steps may be applied to many other types of spam. 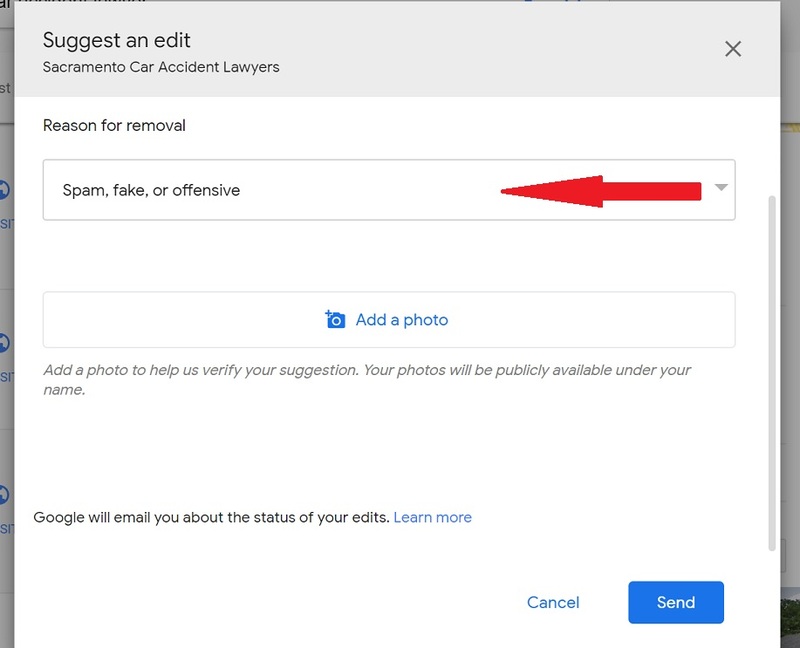 If you’re a user or another attorney or just someone who hates spam, follow the steps below. Step #1: Identify and click on the spam listing. 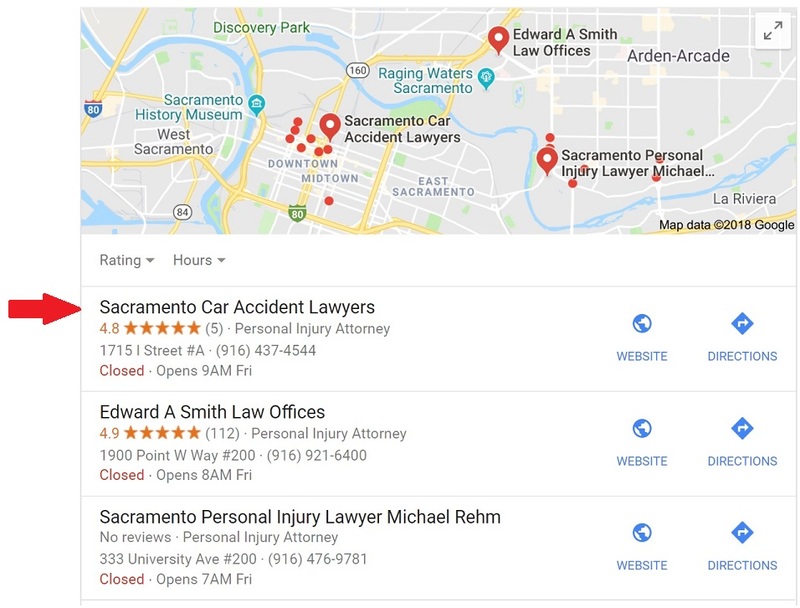 Below is a screenshot of a spam listing for “Sacramento Car Accident Lawyers”. 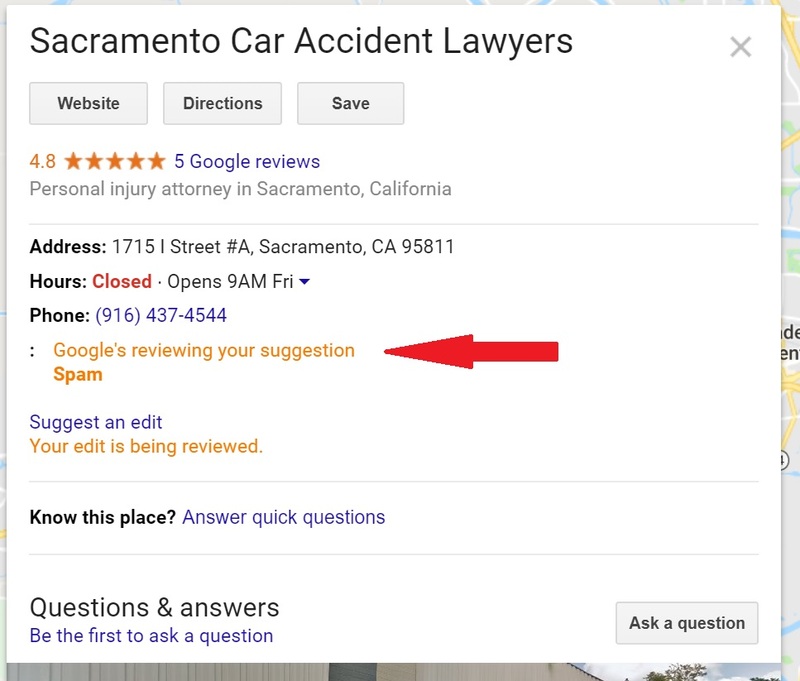 It shows up when you’re searching for a car accident lawyer in Sacramento, California. In this case, if you click onto the website, you get a lead generation page of some sort; there’s just a stock photo of a guy in a suit and an 800 number. But, that’s irrelevant, the listing is spam. Click the listing to see more about the listing and for additional options. Step #2: Click “Suggest an Edit”. Be sure you’re logged into a Google Account for this step. Here’s a screenshot so you know where to look. Step #3: Click “Remove This Place”. Here’s what the screen should look like. Step #4: Select “Spam, Fake, or Offensive”. After you’ve clicked “Remove This Place”, you’ll be presented with multiple options. 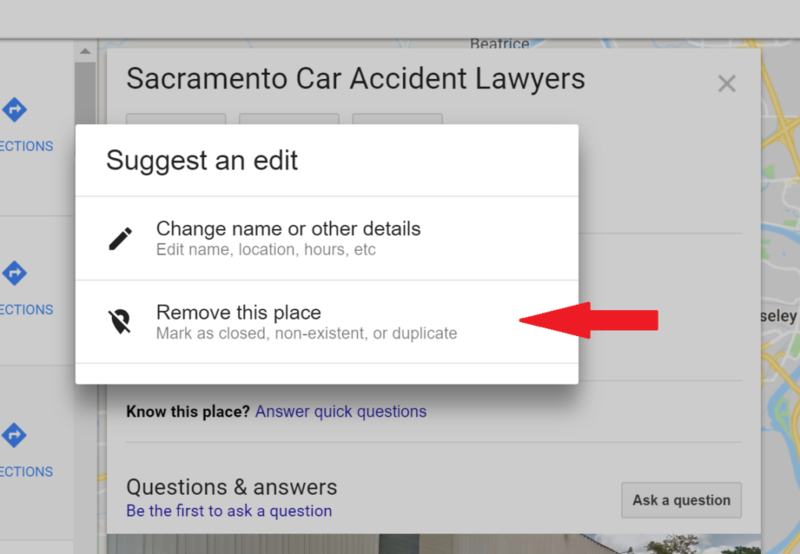 Valid reasons for telling Google to remove a place include the business closing or the listing being spam. In this case, the listing is spam. Below is a screenshot. Once all of the steps above are completed, you’ll need to wait for someone at Google to remove the place. This can take some time. 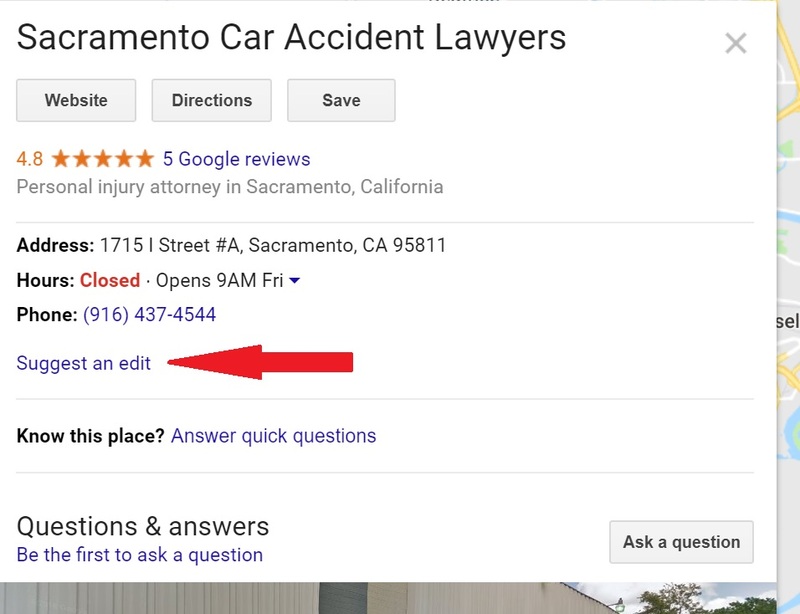 If you’re a “local guide” (someone who regularly leaves reviews in exchange for imaginary points), minor edits, such as business hours, often go through instantly. In this case, the wait may be as long as two weeks. At least that’s what Google suggests. This is a live case study and I am counting down the days. As a test, I reported this spam on November 1, 2018. I’ll update this post as soon as the problem is resolved. I honestly hate to mess with anyone’s listing, but this was brought to my attention by a concerned attorney and asked me how to remove the listing, so I showed them. And besides, it’s just a “lead gen” page – it isn’t for a real attorney website. Lead generation websites are very deceptive and generally detrimental for real people who need real help from a real lawyer. The listing went on without being removed. Finally, I reached out to @GoogleMyBiz Twitter support who eventually escalated it. After 24 days of waiting and tweeting, the spam listing was finally removed. You’re welcome Wyatt Law Group! You’re now in the 3 pack. Edward A Smith Law Offices stayed at the top. The Rehm listing is likely against Google My Business guidelines as well but my work here is done. Google really should police this better; they are basically encouraging spam by taking so long to crack down on blatant spam listings.